You don’t have a most-rumored-Apple-device status board? How do you get through the week? While speculation about an Apple watch is riding high right now, I’ve been wondering about another potential device—one whose very concept gives me no small amount of trepidation. Like a small-town pastor who rails against dancing, I have waged a long and fruitless war against screen-touching. You know what I mean by screen-touching, right? It’s when someone feels they have to literally touch the screen of your laptop with the tip of their finger in order to indicate what they’re talking about. Apparently the words that we traditionally used to indicate things without physically making contact with them crawled out of the English language to die in a forest somewhere. Now the only way to identify something on a screen is to touch it. Like an animal. I’ve fought it for years, but I’m starting to wonder if progress isn’t on the side of screen-touching. 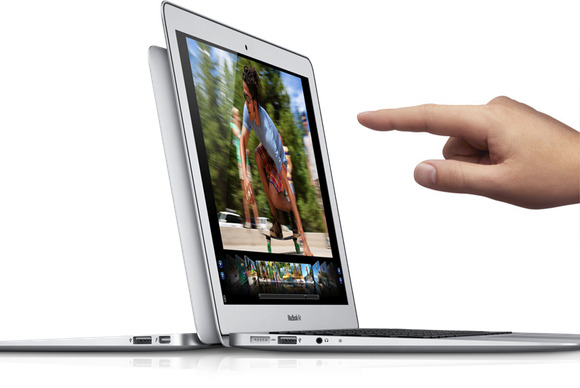 I hate it when people touch the screen of my MacBook. No amount of complaining, however, has stopped them. “Fingers have oils in them!” I say. “And yours have what appears to be peanut butter on them!” They ignore my entreaties. Touch. The other day I was performing a task on my MacBook Air while my nine-year-old son was watching. At a critical moment, he suggested hitting what would have been the wrong button by tapping the button on the screen. Like a lunatic, I gasped and said “No, not that!” Not because of my screen-touching aversion but because, for a second, I thought his touch would actually activate the button. Tablets (and by tablets I mean iPads) have created a new imperative for interaction. While other manufacturers may have shipped touchscreen laptops first, it was Apple that really started us down this road. The difference between an iPhone and a Mac was enough that our brains didn’t confuse the two’s distinct user-input methods. But when Apple started selling iPads with screens only an inch or two smaller than an 11-inch MacBook Air, something clicked. Now it seems like my MacBook screen should respond when I touch it. Yet it just sits there, unmoved and uncaring, like the Mona Lisa or the Sphinx, except smudged with finger oils and peanut butter. I’ve heard the same kind of story from others as well. Now, perhaps we’re all subject to some kind of group delusion. But if you’ve used an iPad—and you probably have—you know that touch has some advantages. I like to imagine that the catacombs of One Infinite Loop are filled with more one-of-a-kind twisted chimeras than the island of Doctor Moreau. Mostly because I have a rich fantasy life. But I would be surprised if there wasn’t a touchscreen MacBook somewhere in there, waiting for the day it’s no longer a freak of nature, but a real live boy—an Apple product. I can’t say it’s going to happen for certain; I have no special knowledge. But one possible clue that Apple might be headed in that direction came when the company switched from inverted scrolling to “natural” scrolling in Lion. Or maybe Apple was pedantically insisting that the trackpad act the same as its iOS devices. I wouldn’t rule that out. Of course, you can’t just slap a touchscreen on a MacBook and call it a day. The last thing I want to do is navigate through menu bars with my fingers. Try that on Microsoft's Surface tablet for a while and you’ll be inexplicably screaming at a litter of adorable kittens in no time. And take my word for it, they will ask you to leave the pet shop if you do that. I haven’t spent a huge amount of time with a Surface, but I have used one enough to know that adding touch to a desktop operating system isn’t a simple thing. OK, I concede that Microsoft put a nice front end on Windows 8, but the minute you hit the classic desktop, it’s like you’ve got sausage fingers (which is a condition, not a delicious microwave treat). I don’t know how to solve this problem—Microsoft doesn’t either, coincidentally—but I’ve learned over the years that just because I don’t know how to solve a problem doesn’t mean Apple doesn’t. Dismissed: You can click and drag to dismiss a notification, but wouldn't it be easier to swipe it? While I don’t like people touching my screen, there are instances where I already want to perform an action by touch instead of by using the cursor. Dismissing notifications is a good example. Clicking on a notification in Mountain Lion and dragging to the right will dismiss it (which is especially useful for software-update notifications that have no button option for banishing them). Doing this with a cursor instead of a finger isn’t the most onerous action I perform in the course of a given day (I have a dog), but a swipe with a finger would be easier. You can also hover over the notification and swipe it away with two fingers on the trackpad and no click, but sometimes a screen element is just asking for a more pointed dismissal. "I said 'Good day' to you, sir. I SAID 'GOOD DAY'!" The use of iOS devices has prompted us to expect screens to be responsive—particularly kids who are growing up with them. While other vendors shipped touchscreen computers first, Apple is the company that could ship them right. Microsoft’s approach has been to say, “It’s got touch because it’s a laptop and a tablet! Also a floor wax! And an ear wax! No, wait, not that. Unless you’re into that. In which case it’s also an ear wax.” Apple’s approach, assuming this particular rumor actually materializes, will have to reinvent user interaction on the desktop. I hope the company takes up that challenge. Because while I hate fingerprints on my screens, I like easier forms of input.